Some stories are personal. This is one. In August 2001, within 3 weeks of each other, two of my stepsisters were diagnosed with cancer. One had breast cancer and one had ovarian. I remember it was such an overwhelming time. We are a big family and have lots of opinions. Everybody had a doctor or crazy treatment they should try. I sought solace in the only way I knew. I cooked. I told you earlier on my blog that I was a Lost Chef. This is another example of how I was brought back into cooking when I was looking for comfort. In January 2002 Time magazine published an article talking about the science of staying healthy and listing the top ten foods. These foods are jam packed with vitamins mineral and phytochemicals. All of these foods have specific nutrients; antioxidants and nutriceuticals that intrinsically help the body do its job better. One of the items was Green Tea. After that article came out I started developing recipes that included these ingredients. I wanted meals that tasted really good and were doing great things for my sister’s bodies. I had a soup, a marinade and several cookies. All these recipes honored my sisters fight’s and made me feel I was helping in my small way. I have to admit that in addition to trying to ease my sister’s discomfort, I was looking to ease my pain and fear of the unknown. I knew food and it had always brought me the comfort that I needed. In coming posts I will share more of these recipes. Today it is green tea. Green tea is great but it is just, that, tea, or brewed water. 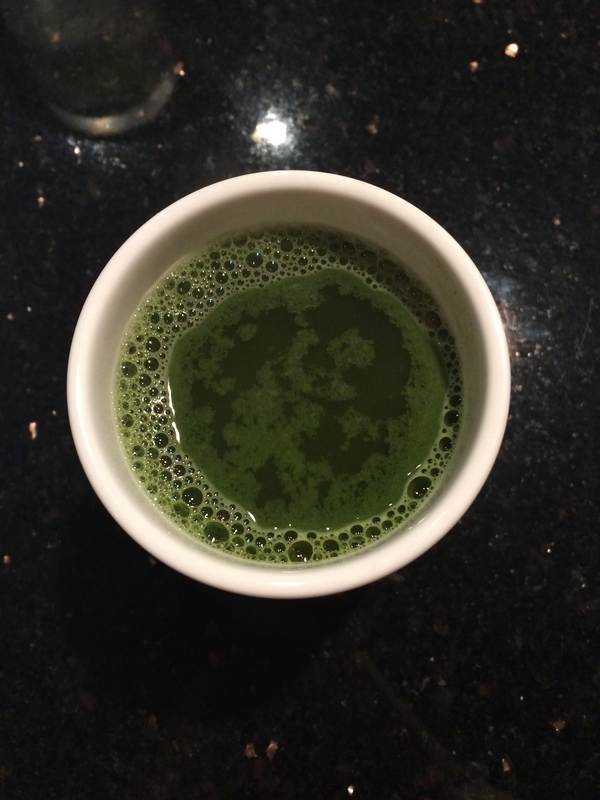 Think about the green tea you make at home. It really varies in color depending on what brand you buy. You can have anything from a pale yellow to a dark brown. Matcha is the whole tealeaf, pulverized into a powder. While its color can vary too, from a dark emerald green to a lighter grassy green, based on how it is prepared, for the most part your benefits don’t change. The benefits include being high in anti-oxidants, enhancing calm, boosting memory and concentration, and burning calories. Green Tea can also lower LDL cholesterol, and boasts a high level of chlorophyll, which helps to detox your body and build your immune system. The good news is the warmer it is served the better the benefits. They all seem to thrive in heat! There are two preparations for Matcha green tea. Usucha is a thin version with froth and is often more bitter than its counter part. Koicha is thick with no froth. Koicha is often described as liquid honey because of its thicker consistency and less bitter taste. Tradition dictates that you stir your Usucha with a bamboo whisks into a frothy drink. Green tea Matcha is served with a sweet before you drink it. This counters the bitterness and eliminates the need to add milk or sugar. Keep in mind the flavor profile can change from cup to cup. Most people have experienced a bitter green tea at some point but if you take the time to prepare correctly you will find a sweet sometimes florally taste. There is, of course, a grassy element. Let’s be honest it is a plant! Make sure you pay attention to the directions on the box and you will avoid the flavor pitfalls and no powdery residue. 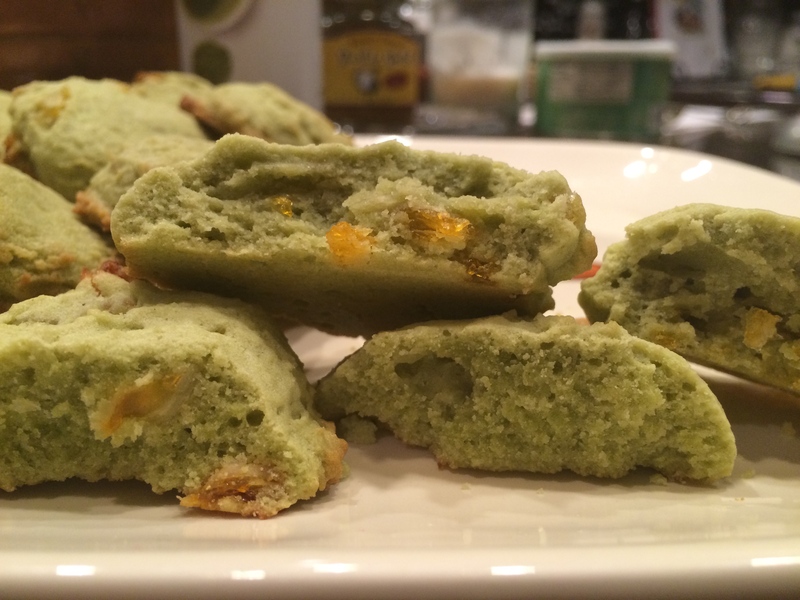 I have put all these thoughts together and created a green tea scone. Most grocery stores have an Asian section, these days and Matcha is becoming more readily available. If your local store doesn’t carry it, most Whole Foods carry several options. I also found a Matcha Chai Latte powder at Trader Joe’s that is fabulous. I use a candied orange peel in the recipe. This can be seasonal (Christmas) if you are buying it pre-made. I also found a dried, mandarin orange slices at Trader Joe’s. They are fabulous here! You can also make your own candied orange peel. Look for an upcoming “Try something new” blog for how to do this. My sisters loved the flavor of the scone and said it was like having a warm cup of tea with a fresh slice of orange. Both my sisters fought valiantly. Unfortunately after five years my sister with ovarian cancer lost her battle. My other sister is a 12-year survivor of breast cancer! Bake for 15 – 19 minutes, until bottoms start to brown slightly. * If you let your dough sit a room temperature for 10-15 minutes the color will deepen. This is a good idea since the baking will cause it to lighten up a little bit.